Mangaluru, Feb 08, 2016: As many as 73 pairs of buffalo took part in the day and night Soorya-Chandra Jodukare Kambala (slush track buffalo race) at Talapady Panjala near Mangaluru on Sunday. They competed under different categories and age groups. The event was organised on the land, located in the interiors of Kinya village and off NH 66 on Talapady. Talapady Doddamane Ravindranatha Shetty is the working president of the Jodukare Kambala Samithi. Inaugurating the event in the morning, area MLA and Minister for Health and Family Welfare U.T. 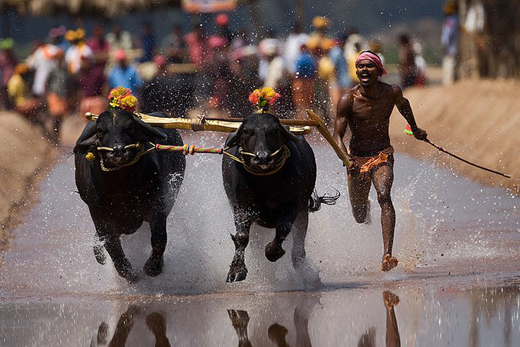 Khader said Kambala and Yakshagana are the two traditional forms of coastal Karnataka. He would be happy to support both these cultural events, he said. Though there was some problem last year in organising Kambala, this year there was no such problem, he said. Owners of buffaloes started arriving at the venue since early Sunday morning, loading their pet partners carefully on goods vehicles. As soon as the animals were loaded from the vehicles, they were splashed with cool water, for which separate arrangements were made. Later, the owners brought them under tree shades or under shamiyanas. The event started with Hagga Hiriya and Kiriya (Rope senior and junior) in which 20 pairs participated. This was followed by Negilu Hiriya and Kiriya (plough senior and junior), which saw 47 pairs participating in the category. The last ones were Halage (wooden plank) and Kane Halage, the main attractions. The competitions would go on till early Monday morning, said Nettilabala Mohandas Shetty, Secretary of the Samithi. A posse of police personnel was also deployed at the venue for security arrangements as well as to ensure that the organisers and owners do not violate directions by the Animal Husbandry and Veterinary Sciences Department that the event should not unleash any violence on the animals.